A cute game about 3 girls playing with a spiritboard and getting more than they bargained for! Started out as a cute spiritboard thing like an 8 ball but became a visual novel without me realizing it. If you want the executables there is a itch.io page it also contains the full code with comments which I sadly had to strip for the bbs release. The question menu is controlled with x to go to the top of the menu and c to select. Enter opens the start menu. To use the paste option on the question menu you must first paste into the game before it can access your clipboard. 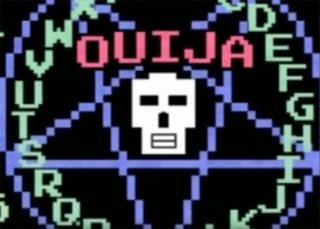 The Ouija board seems to be missing a few letters. Yeah In the final rejig of the spritesheet to make it fit the compression limits I got rid of all non essential sprites like the blood splash on the board and then redrew them in the gaps I had in the sprite sheet but I messed up the transparency. I've fixed it now and a text overflow that got through. Oh man that was so fun. This is a good use of PICO-8. I really like the dialogue, nice job there. That was really well done! The characters were great, and there were quite a few genuinely funny moments.